The latest in a long line of vocal effects processors from DigiTech, the Vocalist Live FX processor puts studio quality effects right at your feet. 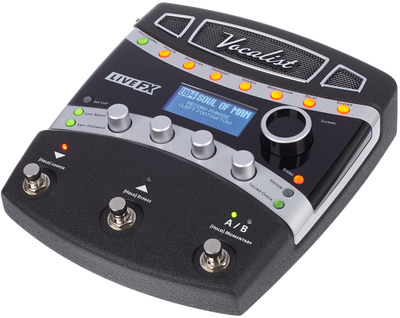 This foot-controlled vocal effects unit boasts an impressive array of effects, including Lexicon reverbs and DBX compression, along with a new Live Adapt feature that can automatically detect the tempo, key, and input level of your song, and make the necessary adjustments for delays, harmony/pitch shifting effects, and noise gating, easily creating the best possible vocal sound for your performance or recording. The Vocalist Live FX sounds more than good enough for the studio, but it’s built for, and thrives on the stage. DBX Automatic Feedback Suppression setting automatically employs 12 filters to prevent feedback, and the Gold Channel gives you the power of a full channel strip, complete with EQ and dynamics control, to add a professional shine to your vocals before you even begin to tweak the effects, presets, and looping options. In addition to name-brand reverb and dynamics, the Vocalist comes loaded with additional distortion, filter, pitch, doubler, de-essing, harmony, and modulation effects that can be applied at your discretion, or used within 1 of 99 presets. Using the presets, many of which are designed to emulate iconic vocal sounds, users can apply everything from professional shine to lo-fi distortion. An additional 99 preset slots are available for users to build their own recallable settings. Users have an available 70 seconds of recording time, for live looping, or for auditioning effects and tweaking sounds. This feature comes in extremely handy if you wanted to experiment with different effects before you hit the stage. In fact, the Vocalist Live FX allows users to build a set list directly on the pedal, or by using the preset and set list management software (for both Mac and PC). Users can store up to 20 presets in set list mode, and easily cycle through them during a performance. On the rear of the unit an Aux input allows for playing or singing along with pre-recorded tracks, and an input gain helps with maximizing your signal level pre-fx. An XLR input with phantom power, combined with left and right XLR outputs, a headphone output, footswitch, and USB port are all also found on the rear of the unit. The Vocalist Live FX is powered by an included 9V power supply, which also plugs into the back.